The Forster Co-Ax® Press is the “Cadillac” of reloading presses. If you have any doubts as to how well the Co-Ax works, just “ask the man who owns one.” Ace shooter Jerry Tierney has a Forster Co-Ax and he’s found that it produces ammo with less run-out than many other conventional “O”-style presses for threaded dies. 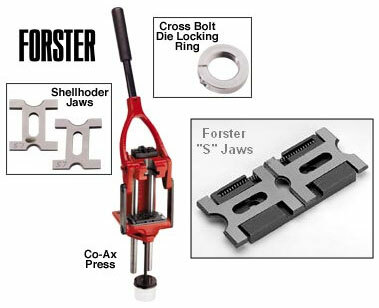 The Co-Ax’s spring-loaded shell holder jaws float with the die, allowing cases to correctly center in the die. Dies snap easily in and out of the jaws so you can change dies in a couple of seconds. The Co-Ax press accepts any standard 7/8″x14 threaded reloading die. You will need to use cross-bolt-style lock-rings on your dies. We recommend the Hornady rings. These are steel and have a hex-head cross-bolt. The Co-Ax requires no expensive shell-holders. The standard “S” jaw set supplied with the press fits nearly all common calibers except except: 22 Hornet, 378 Wby., 45-70, 256 Win. Mag., 44 S&W, 416 Rigby, 416 Rem., 45-90 and 348 Win. These calibers can be used if you purchase the optional “LS” Jaws. If you’re working in a limited space, or are using the press with mostly small cases that require minimal effort to resize, you can fit an optional short handle to the Co-Ax. Forster item SH1000, the short handle has a comfortable ball top and retails for about $18.00 street price. It is simple to install on the existing Co-Ax yoke.